Around this time of year, my morning oatmeal routine is getting a bit, well, routine. 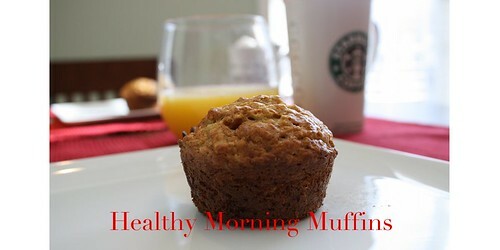 This weekend, we enjoyed healthy morning muffins and they were the perfect change of pace. Moist without traditional fat, these muffins have add-ins like carrots, bananas and raisins that make them the perfect way to flavorfully kick-off the calorie conscious season without sacrificing flavor. 1) Preheat oven to 400 degrees. Coat 12-cup muffin pan with cooking spray. In a large bowl, whisk together flour, brown sugar, baking soda, baking powder, nutmeg and salt until there are no lumps. Stir in oats and raisins. Add oil, egg, milk, carrots and banana and stir until blended. 2) Fill each muffin cup with 1/4 cup batter. Bake 23-25 minutes. umm those muffins look yummy! sound delicious..a must try. thanks for posting! Love this recipe. I'm definitely trying it soon. I make muffins for the kids a lot for afternoon tea. Often, I substitute the white flour with half wholemeal flour and half white flour just to cut down on the refined white stuff. These look so great!! And where have I been? The new look on your blog is awesome!! And carbon neutral! Try using organic blue agave nectar instead of the brown sugar. It is a low-glycemic sweetener and will make those yummy health muffins even better. I make a similar recipe using the agave nectar. I also use half white flour and whole wheat and add ground flax seed to bump of the nutrition. Love the blog! i soooooo love your blog, just found it and now addicted. Sounds yummy! I make something similar with flaxseed meal. Try adding 3/4 cup flaxseed meal to those! they smell yummy...baking in the oven now!